Despite the photos of old gramophones, all the records in the podcast have been transferred using modern equipment, with careful attention to correct equalization. Most of the transfers have been noise reduced using ClickRepair and DeNoise by Brian Davies. A podcast featuring 78rpm records from my collection, including music-hall comedians, operatic vocals, spoken word, jazz, dance bands and unusual recordings: available both in a plain audio (MP3) version, and an enhanced (MP4) version with illustrations. 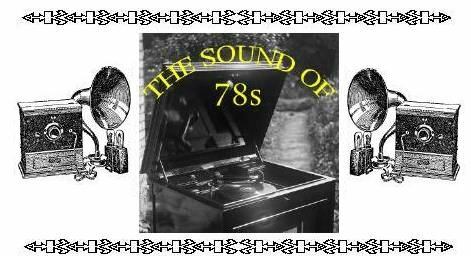 The 'Sound of 78s' podcast is completed: but my site 'Stars of 78s' is now available and includes recordings by Peter Dawson, Gracie Fields, Amelita Galli-Curci, Theodore Chaliapine, Billy Williams, Paul Robeson, Paderewski, Harry Champion, Ernest Lough and George Robey. The final episode of 'The Sound of 78s': British Dance Bands - The Kit-Cat Band, Roy Fox, The BBC Dance orchestra directed by Henry Hall, and Bertini and the Tower Blackpool Dance Band. The file is 10.2MB and the recording lasts 14m 53s. The file is 10.7MB and the recording lasts 15m 34s. Music-hall performers George Formby Sr., Clapham and Dwyer, and Sophie Tucker. The file is 9.8MB and the recording lasts 14m 13s. Operatic vocals from Tetrazzini, Amato, Korjus and Zenatello. The file is 12.3MB and the recording lasts 17m 59s. Jazz pianists Percival Mackey; Jelly Roll Morton; Meade Lux Lewis, Pete Johnson & Albert Ammons; and Oscar Peterson. The file is 9.1MB and the recording lasts 13m 18s. Music-Hall comedians Harry Lauder, Billie Richardson and Harry Weldon. The file is 10.8MB and the recording lasts 15m 43s. You can see the full-sized version of the photo in the header here. In case anyone isn't sure exactly what a podcast is I have written an explanation page. Most of the records in this podcast have been digitally noise reduced using ClickRepair and DeNoise by Brian Davies.